A properly set-up rig can make all the difference to your performance, we explain how the dark art of rig tuning works. 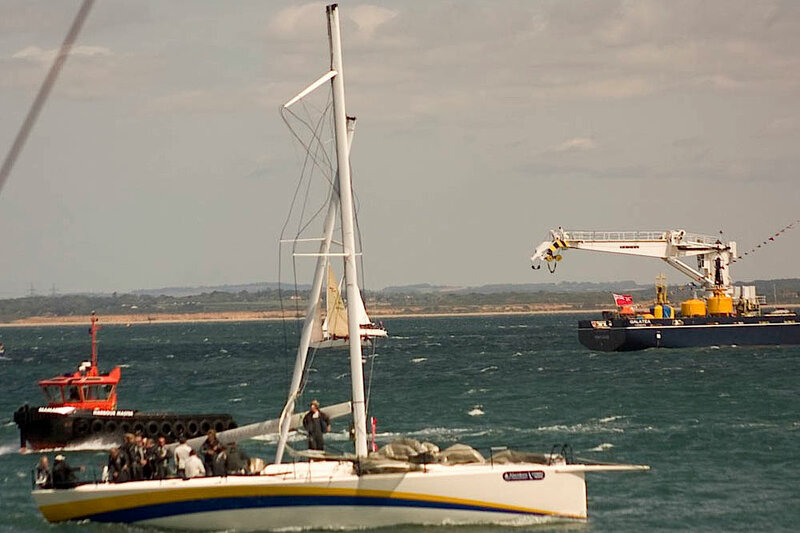 Many yachts have poorly adjusted standing rigging that can impair performance and handling, as well as threatening the security of the rig. Even new boats are not immune from problems - they inevitably deform under the considerable loads of their rig, and therefore will need to be re-tuned after a period of use. Rig tuning might seem to some like a black art, but once you master the basics you will be set for life. Tuning your rig - left adding turns, right measuring the tension using a vernier guage. 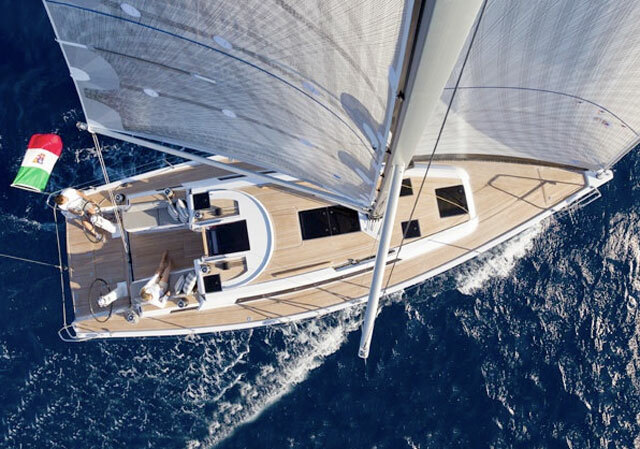 To check the adjustment of your rig start by sailing close-hauled with the boat nicely powered up at around 20 degrees of heel – ideally with full sail in flat water and around 10-14 knots of wind, depending on the vessel. Start by observing the cap shrouds on the lee side – they should have a very small amount of residual tension – if they are loose the shrouds need to be tightened. Once the cap shroud tension is correct, sight up the mainsail track on the aft face of the mast, with one eye as close to the spar as possible – you should see the mast is perfectly straight athwartships. If the centre of the spar sags away to leeward, then the windward lower shrouds are too slack and vice versa. Having achieved good tune with full sail check the rig is also okay when reefed in stronger winds. 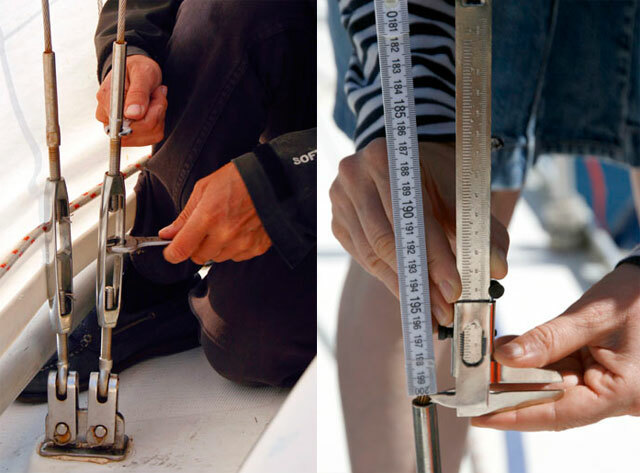 Many boats have tuning guides provided by their rig manufacturer or sailmaker – if so use those instructions for adjusting the rig; otherwise these generic instructions will help improve the set up of your boat. The shrouds on each side of the boat should have exactly the same number of turns on their bottlescrews - riggers make each the same length, so assuming the boat is symmetrical, this will ensure the rig is upright athwartships. 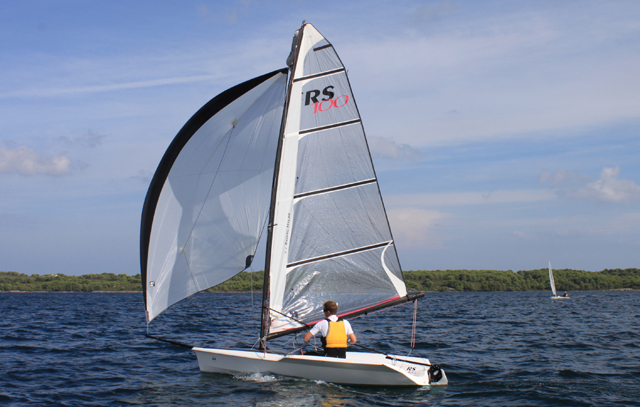 Don't even bother to attempt to adjust tension in the windward shrouds when sailing – it's an impossible task. However, being under minimal tension, the lee shrouds are always easy to adjust. Having done this, tack immediately, adjust the other side by the same amount. you can then check the tension in the cap shrouds, sight up the rig again to check lower shroud tension, and repeat the process as necessary. While the rig should be in a perfect column athwartships, there should be a degree of fore and aft bend. In particular, the mast must never be allowed to develop a 'negative' bend, where the centre of the spar is abaft of the masthead. Sighting up one side of the mast – again with one eye as close as possible to the spar – gives the best indication of the amount of bend. On a hefty masthead rig the optimum deflection of the spar is likely to be around half its diameter, however a spindly 7/8ths fractional rig may see deflections of up to two or three times its diameter. 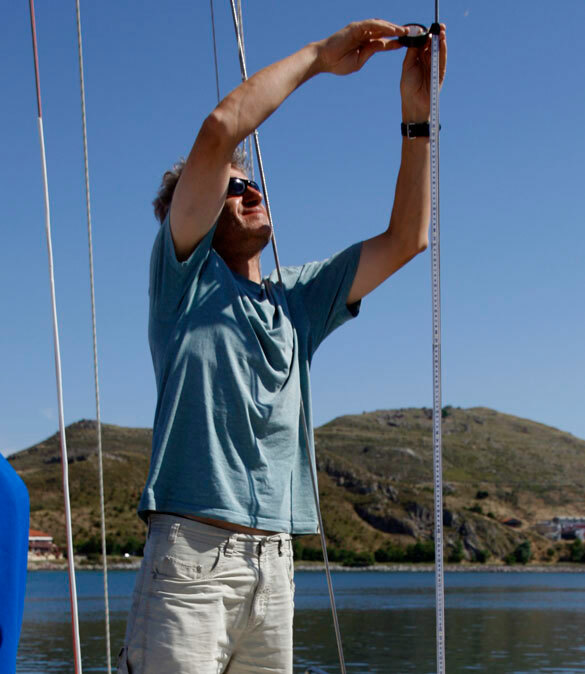 Modern fractional rigs of 9/10ths or or even 19/20ths fitted to many cruisers tend to be closer to a that of a masthead rigged boat in this respect, while allowing for a little more mast bend to control the shape of the mainsail. 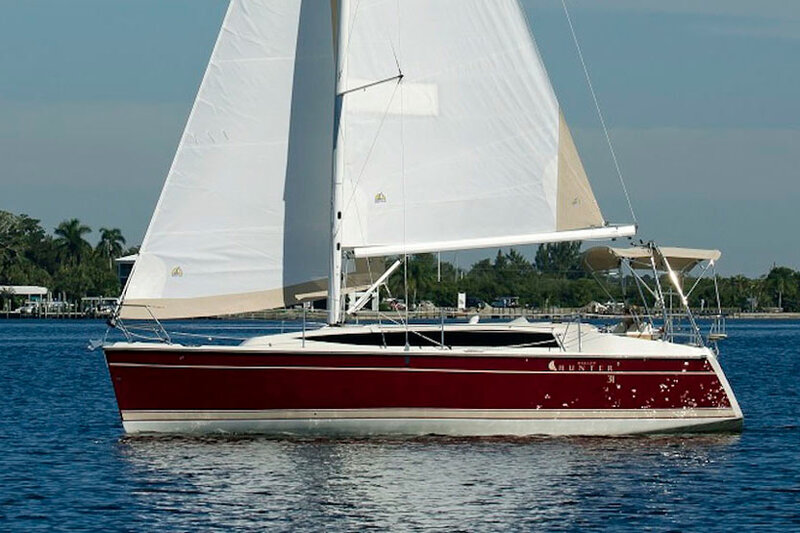 With a simple rig with a single pair of in-line spreaders, the key controls for mast bend are the backstay and babystay (or forward lower shrouds). Additional tension in either of these will increase the amount of bend. The (after) lower shrouds pull the centre of the spar aft and therefore are the key control in limiting bend. As well as increasing mast bend, and therefore helping to flatten the mainsail as the wind increases, additional backstay tension will reduce forestay sag. This has a similar effect in flattening the luff of the headsail, reducing power as the wind increases, and improving the boat's ability to point close to the wind. The backstay is also important in ensuring the masthead cannot move forward of its proper position when the forestay is highly loaded. 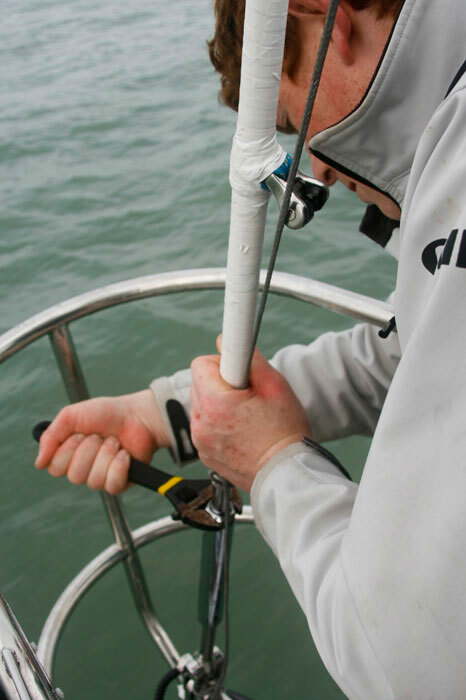 On most rigs backstay tension should vary from a base setting of 15 per cent of the breaking tension of the stay to a maximum of 30 per cent. An adjustable backstay marked with these settings is certainly a useful addition to a yacht's inventory. The geometry of typical rigs means forestay loads will be around one-third higher than the backstay load, so a backstay tensioned to 15 per cent of its breaking strain will load the forestay to around 20 per cent of its breaking load (assuming both are of the same diameter wire). Optimal mast rake is important to ensure good handling - too much will create excess weather helm, whereas too little will cause undesirable lee helm. Rake is solely a function of forestay length, with most boats needing around 2-4 degrees of aft rake to give optimal balance. The situation is more complex for boats with swept-back spreaders than those with a single pair of in-line spreaders. As well as load in the cap shrouds helping to promote mast bend, the cap shrouds also contribute a considerable amount of the forestay tension. 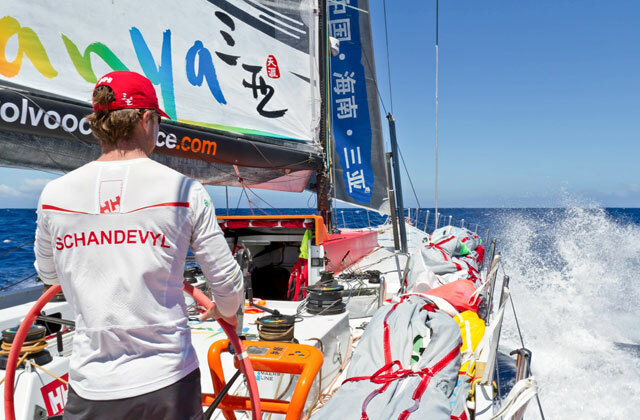 To maintain the fore and aft stability of the rig it's also important that the leeward cap shroud remains tight when the boat is fully powered up. This means the rig must be set up a little tighter than that of a boat with in-line spreaders, with each cap shroud at rest typically tightened to around 20 per cent of its breaking strain, compared to around 12-15 per cent for a rig with in line spreaders. Checking the rig tension using a guage. 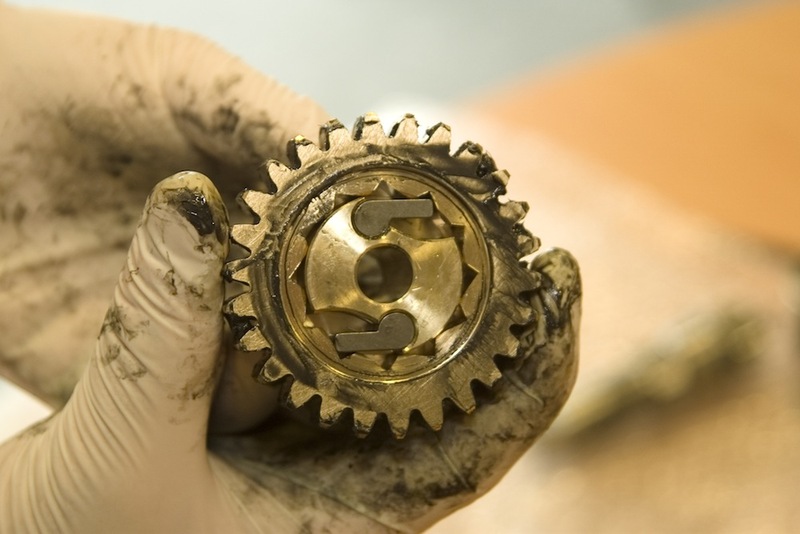 This is a relatively simple process that can be achieved with basic tools. The complex and expensive electronic strain gauges that are becoming more common on race boats and large cruising yachts are therefore not essential. One the simplest methods is to measure the extension of a 2m length of the wire when it is loaded. 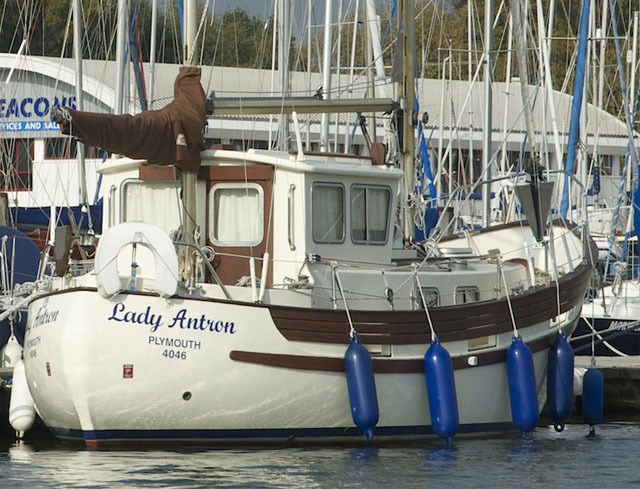 With the 1x19 stainless steel wire that is almost ubiquitously used on cruising yachts and most cruiser-racers, there's a very simple formula to remember – irrespective of its thickness, a two-metre length of wire will stretch by 1mm for every increment of load equivalent to 5 per cent of the breaking strain of the wire. Position the lower end of a 2m-long stick (or rule) just above the swage terminal, then tape the top of the rule to the wire. As the load is increased, a vernier gauge can be used to measure the increase in the distance between the bottom of the rule and the swage (see photographs). A similar principle can be followed using a Loos gauge to measure rig loads. For a more on getting to grips with your rig, see understanding your rig: basic rig checks and common problems, or find out more about using a Loos guage here, mast manufacturer Selden also has a useful guide to rig tuning.